Post Pay is a pricing feature that gives cam sites, and other token-based services, more control over how they authorize and settle purchases. If you’ve created and implemented Digital Purchase and/or Dynamic price points that are enabled for Post Pay, the Post Pay report shows you important details about transactions made on these price points. 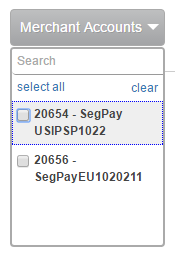 Login to the Segpay Merchant Portal at: https://mp.segpay.com, and point your mouse at the Performance Reporting menu. Select Post Pay Report. The following steps will help you generate a report with the data you want. 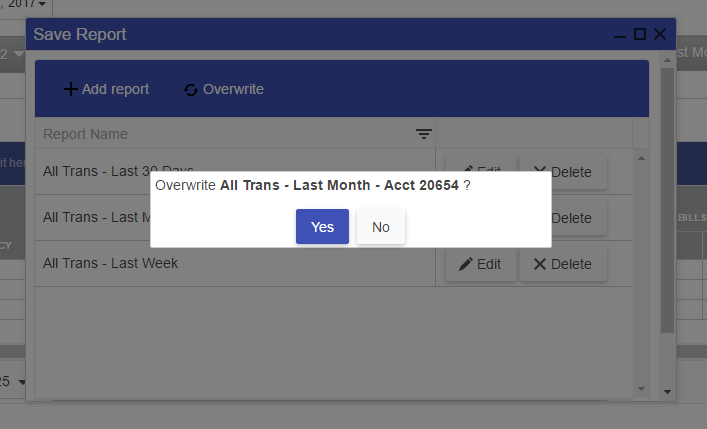 Click Choose from a Saved Report if you want to retrieve a specific report you’ve run previously, so you don’t have to re-create it (see the Saved Reports section near the end of this document for more detail). Otherwise, see step 2 below to generate a new report. First, select the merchant account(s) you want to see in the report. Notice the search box, which comes in handy if you have multiple merchants to scroll through. 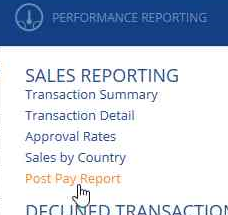 Select the currency(ies) of the transactions you want to see in the report. You can select USD, GBP and/or EUR. For example, if you accept payment in EUR and USD, you can generate a report with only the USD transactions, or select all to see everything in one report. 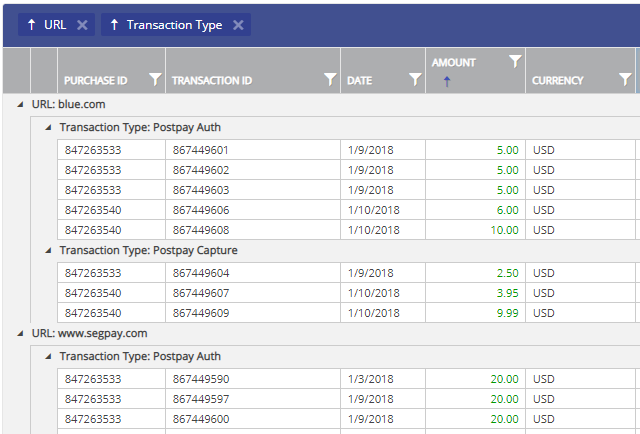 Note that if you select multiple currencies here, the total for the Amounts column in your report will reflect a blended total of all currencies. Select one currency at a time to see true totals for each. Select which specific Cash program(s) you want included in the report. Cash programs group your websites together by affiliate program so it may be easier for you to report by cash program instead of selecting URLs (in the next step). Click the URL(s) menu to see a list of your websites. All are selected by default, but you can select only specific sites to be included in the report. Note the Search box, which makes it easier to find a specific site if you have a large list. 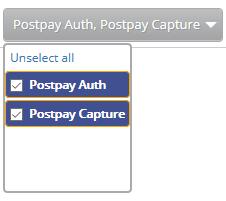 Select whether you want to see Post Pay Authorizations, Post Pay Captures, or both. Click Generate Report. 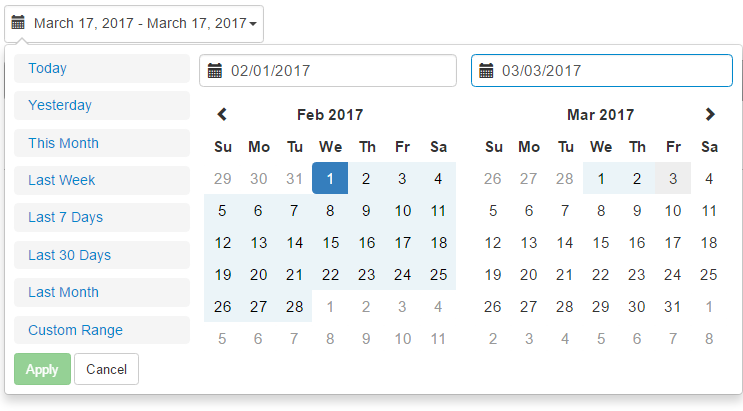 By default, results are sorted chronologically by date. Each row represents a specific Post Pay transaction that occurred during the date range you selected. Click on any column header in the report to sort the results according to the values in that column. For example, click the Amount column header to see the smallest amounts first, then click again to re-sort by largest amount to smallest. You can filter the data in any column by clicking the inverted triangle icon next to the column header (see image below). 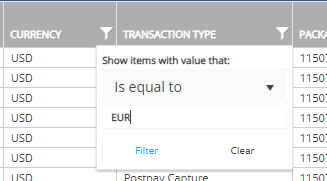 Choose an option, such as “is equal to” and type the value you want to filter for. For example, “is equal to” EUR will only show rows where the value in the column you filtered is EUR. You can clarify the report by grouping according to any of the data points available in the report. Just click the column header you want to group by (for example, URL), then drag and drop onto the blue bar above the report results. You can drag and drop multiple column headers to clarify things even more. By default, the report will display 25 results per page, maximum. Click the Items per Page menu below the report to increase the results per page to 50, 100 or “All” (to see all results on one page). Click Add Report (in the top-left area of the window), give your saved report a name and click Save. Now, any time you click Save this Report, you’ll see your existing reports listed, with the ability to delete your saved report, or edit its name. Note that your saved report will include the settings you selected in steps 1-7 above; however if you sorted or grouped the report by any specific column(s), the saved report will not include those customizations. If you want to make changes to a saved report, just open the report, make your changes and click Save this Report. 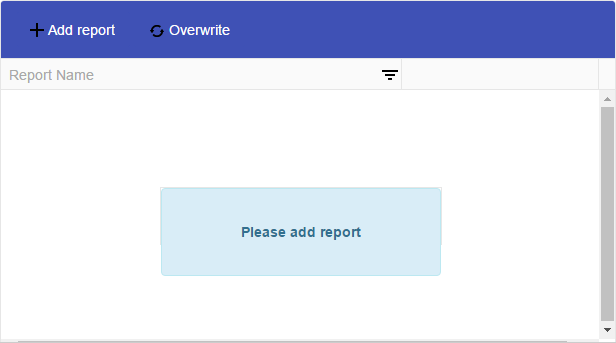 Then click Overwrite to update the report with your changes. You can export your reports to CSV, PDF or Excel files. Just click Download in the top-right area of the report. Then enter a file name, select a file type (CSV, PDF or XLSX) and click Save. The report will be saved to the Downloads folder on your computer. Please feel free to let us know any thoughts or suggestions you have about this report or anything else, by emailing Techsupport@Segpay.com.